Winning Futures is an award-winning nonprofit organization providing activities and programs for struggling students through workbooks and training handbooks. When enrolling in our program, youth will learn life skills such as being their own leader, setting academic and personal goals, defining success, building positive relationships, appreciating diversity and mapping out their future. Our programs for struggling students make a powerful impact on all students, while helping them develop their own identity, as well as teaching them how to become self reliant. Although, our curriculum is not designed specifically for struggling students; it has proven to have great success with struggling students and at-risk youth. 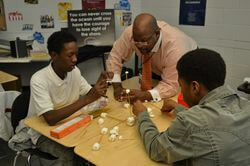 We are committed to teaching youth the important life skills they will need in order to ensure a successful future. The Winning Futures curriculum has shown statistically significant improvements in many key areas. A long-term study of graduates of our program revealed that nearly 100% of students believe they can accomplish career goals and 84% decided to attend a higher level of education than they had originally planned. To learn more about the Winning Futures workbooks and our programs for troubled youth, visit https://winningfutures.org or contact us.